SMS touch is a text-messaging app with global coverage. That means you can send an SMS to mobiles (cell phones) in 820 mobile networks in 220+ countries for a flat rate of just ten cents (no roaming or international charges). Works over 3G, 4G and WiFi. With your current mobile plan, you probably pay upwards of 60 cents for an international SMS text message. SMS touch charges you a flat rate of 9 cents, so you will recover the purchase cost of this app very quickly. SMS touch is also useful for iPod touch users. It will turn your iPod touch into a text-messaging device in any WiFi zone. 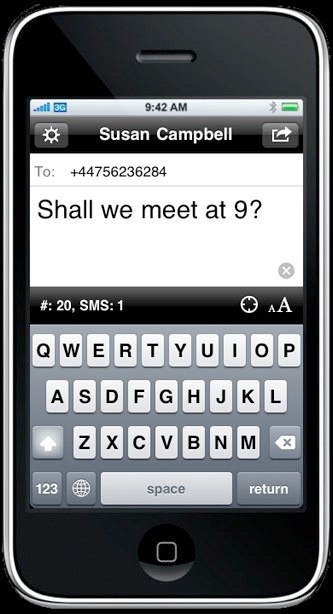 The Templates features allows you to reuse often used text messages. Using the Favorites feature you can quickly select one of your favorite recipients. No commercials are tagged to your message, the entire message (all 160 characters) is yours. We take customer support of SMS touch very seriously and we are able to track the delivery status of each SMS. Most important of all, you yourself will also be able to check the delivery status of each SMS you send. You can configure the app in such a way that you will receive Delivery Reports by email of each SMS that was delivered. You can also receive a email copies of each SMS you send. You can buy SMSs through the App Store via In-App Purchase in bundles of 10, 100, 500 or 1000 SMSs. 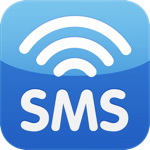 SMS touch is the iPhone/iPod version of SMS Mac, the award-winning SMS text messaging application for Mac OS X, which for more than five years has proven to be a reliable, efficient and easy way to send text messages on the Mac. SMS Mac includes three software programs : an Address Book plug-in, the award-winning Dashboard Widget and the SMS Mac AppleScript application.